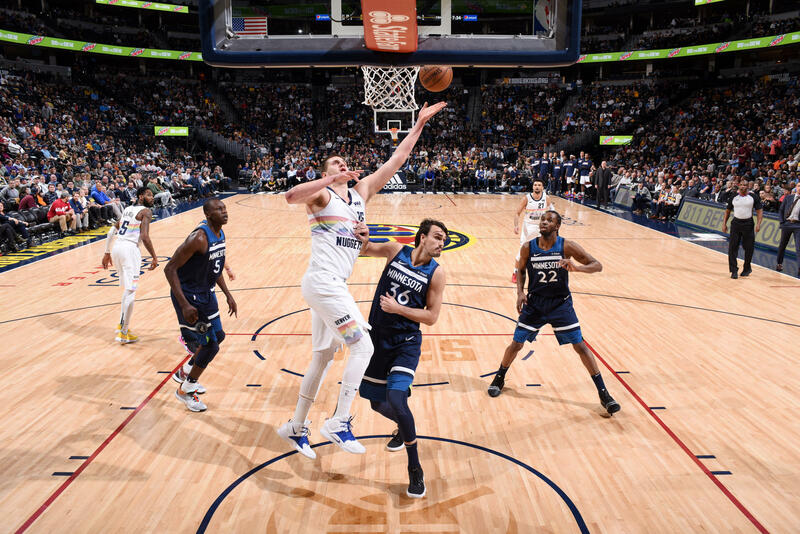 Last season, the Nuggets faced the Timberwolves on the last day of the regular season to contest who would be advancing to the Playoffs and who was going to take an early summer. The Timberwolves beat the Nuggets in OT and Minnesota advanced to the post season as the eighth seed. This season the two teams faced off once again in the last day of the regular season. The circumstances were different this time around. The Timberwolves were fighting for nothing. They were already booted out of the Playoffs weeks ago. The Nuggets were surely in. They were one of the top teams in the West, all season long. Denver was playing to determine whether they’d finish with the second or third seed. The way the game was going, it was like the Timberwolves were the ones with Playoff implications at stake. Minnesota, playing without Karl-Anthony Towns took, played inspired basketball. They took a double-digit lead midway through the final period after a Cameron Reynolds three-pointer. It looked like the Timberwolves were going to replicate last year’s finish. The Nuggets were determined not to let that happen again. The Nuggets caught fire from beyond the arc with Nikola Jokic, Will Barton, Paul Millsap and Jamal Murray each hitting a three to spark a 15-0 run to close the game. Denver took the lead and held on until the final buzzer. The Nuggets are now officially the second seed heading to the Playoffs, a complete turnaround from how they ended last season. The Blazers are banged up. Taking the third or fourth seed didn’t matter as much as resting their key guys. But the lineup that Coach Terry Stotts fielded today was something else. He only played six guys, including playing three players all 48 minutes. Those six players were Meyers Leonard, Skal Labissiere, Jake Layman, Gary Trent, Jr., Anfernee Simons and Zach Collins, off the benhc. Layman, Trent and Simons played all the minutes during the game. Predictably, the Blazers fell behind, fell behind big time against the young Kings. They fell behind by as much as 28 points, as Sacramento erupted for 48 points in the second quarter. But something remarkable happened, Portland started to fight back. From down 28, the six players rallied to win the game by five points, outscoring Sacramento 38-18 in the final period. This performance should give the Blazers confidence heading to the Playoffs. With so many of their players missing or not 100%, this game shows that the bench mob has what it takes to carry the team for key stretches of the game. Coming into the game today, only the Boston-Indiana First Round match-up was set. The Hornets and Pistons were vying for a spot in the East bracket while the Nets and Magic were out to finalize their standings in the post season. All the Pistons needed to do was win their game in order to advance to the Playoffs. They took care of business by blowing out the Knicks, making sure that there would be no questions about their spot in the next phase of the season. The Pistons will advance to meet the top-seeded Milwaukee Bucks. The Nets didn’t allow themselves to get caught up in the #LastDance celebration of Dwyane Wade. They beat the Heat easily to secure the sixth seed and set a match-up against the Philadelphia 76ers. The Magic were the ones that shut the door on the Hornets. They beat Charlotte to not only end the Hornets’ Playoff bid, but also to ensure that they’d take the seventh seed in the East bracket. After dropping a 30-piece in his last home game, Wade continued his incredible stretch to close out the season. Wade closed out his career with a triple-double performance in a loss to the Nets. Wade got the triple-double late in the third period when he found long-time teammate Udonis Haslem for a midrange jumper. The Brooklyn crowd gave Wade a lot of love. But what made this final game special was that Wade’s closest friends in the NBA was there to appreciate his performance. LeBron James, Chris Paul and Carmelo Anthony all watched from courtside and went crazy with everything that Wade did. They almost stormed the court when Wade secured the triple-double. What a Last Dance it’s been for Wade. Now he gets to hang up his shoes and enjoy the retired life. Maybe it was only proper that Dirk Nowitzki ended his career facing a team that he’s had a ton of memorable battles with. The Mavericks faced the Spurs for the final game of the season, and the final game of Nowitzki’s career. Just like the Spurs have done to other legends, they made a classy tribute video to celebrate Nowitzki’s career and performances against them. Then Dirk gave them one more performance to remember. He dropped a 20-10 double-double, including one of the happiest final baskets ever. Nowitzki will go down as one of the best players ever. Not just among European (he’s the greatest in that classification) but in the history of the league.